The most Extravagant Baby Showers – Kardashian-Jenner style! If there’s one thing that celebrities do well, it’s baby showers. Not just any celebrities though, the Kar-Jenner clan. We’re not referring to a surprise on the inside kinda’ gender reveal cake either. We’re talking about giant inflatables and cherry blossom covered rooms. Baby showers were originally thrown to shower the mama and papas-to-be with gifts so that they don’t have to spend their own dollars, for the KarJenners, it’s a different story. Unlike us regular people, they go all out, no expenses spared. Kimmy K even threw John Legend’s wife Chrissy Teigen a surprise baby shower for the hell of it. Jheez Kim, way to make our friends feel bad. Take a seat (you’re going to need it) as we cover our favourite celebrity baby showers of all time. Well, it wouldn’t be an accurate list without a Kardashian or a Jenner on it. Last year, the Kar/Jenner clan were blessed with the ‘trio’ in the form of cutie cousins, Chicago, Stormi and sweet baby True. All three bubbas were born within 3 months of each other which meant that we spent our days on Instagram scrolling through their OTT baby showers in shock. Let’s start with Kim. The baby bash was typically over-the-top, featuring a forest of cherry blossoms covering the whole room. That’s right, the whole room from floor to ceiling. Welcoming a guest list full of A-listers like Maria Menounos, Chrissy Teigen and celeb hairstylist Jen Atkin, baby number 3 was welcomed in true Kardashian style. A celebrity-filled, pink affair that we’re still struggling to get over. True, True, sweet baby True. Before she even made it out of the womb, this little chick had possibly the best party of all time thrown for her. This was the sort of occasion that made Kim’s parties seem relaxed, and that’s no lie. Flower extraordinaire Jeff Leatham put together a pretty pink setting of flowers, roses and there was even a zoo of giraffes and elephant topiaries. A topiary you say? If you’re as confused as we’re guessing, its ‘the art or practice of clipping shrubs or trees into ornamental shapes’. That’s right, trees in the shape of elephants, we kid you not. If we’ve learned a single thing from these lavish affairs, it’s that you can’t throw a baby shower without going all out. 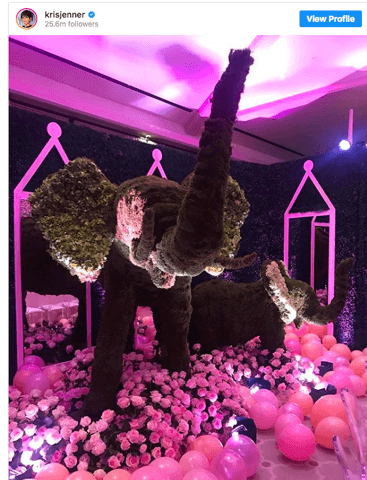 Put it this way, if there aren’t any mountains of florals, forests of greenery, rooms full of balloons, and as many elephants and giraffes as you can fit in one place at your baby shower, then it simply isn’t a celebration. If you’re thinking about hosting your own baby shower or throwing one for a friend, the team at Melbourne’s Best Functions know exactly what it takes to turn a venue into a magical wonderland full of love. Whether you’re after a beautiful flower wall for those all-important photo opportunities, or themed catering ideas, call us on (03) 8199 3733 and we’ll make it happen.